Serenity Now: "Well, first of all, I can do that." 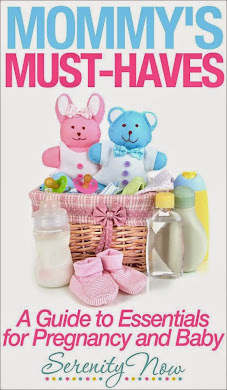 I had to title my Girls' Night post with a quote from Ellen, the best guest judge ever. While I can't do most of the moves anymore that the So You Think You Can Dance? dancers performed on Saturday night, there was a time that I could perform some of them. So what can I say about my girls' night to see the Top Ten dancers from Season 5? It was, well...exciting. After 4 a plethora of emails inquiring after my girls' night, I knew I had to share the experience with you, my friends. I'll hit the highs and the lows. And, oh, there were lows. My friends and I began our evening with a stop for some fine dining at P.F. Chang's in Richmond. The wild eyed look in that horse's eyes should have been a foreshadowing of the evening to come, but we were too busy coercing the parking valet to take our picture. As we waited for a table to open up, we took a stroll through the lovely outdoor mall. To die for trunk/coffee table! So pretty, I could just eat it up! By the time we'd finished our jaunt down the commons area of the mall, we realized that it had been quite some time since we'd put our name in with P.F. Chang's hostess. A check-in revealed that it was prom night, as proven by the multitude of young girls dressed like strippers. I swear, Richmond's prom theme must have been "Pretty Woman" or something, but I digress. My friend L worked some magic with one of the managers and yadda yadda yadda, we ended up with a table much sooner than we should have, VIP service, a free entrée, and a free dessert! Lettuce wraps were the appetizer of choice...yum! The area manager personally brought out 6 different cakes in shot glasses, one for each of us. I like to think it is because we were so cute, but in reality there was a really gross spot on one of the appetizer lettuce leaves, and I think he felt bad. We left P.F. Changs a bit late. L was nervous because she hates driving in Richmond, Angela was nervous because we were going to be late for the show, and I was nervous that perhaps I should have worn heels with my jeans because my flats just weren't getting the job done. As I continued my internal fashion debate, I noticed an odd sensation on the outside of the car under my foot. Pretty soon, everyone else did too. As I opened my door, to add insult to injury, a very dead squirrel was staring. directly. at me. I have chosen not to post his picture to protect his identity. 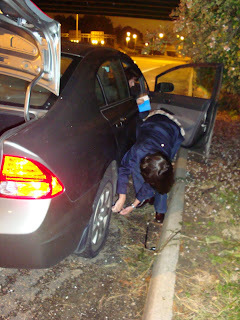 Out of 4 women in the car, not one of us knew how to change a tire. I had a lesson from my dad once when I was 16, but I have completely blocked that damaging incident from my memory. C, the pregnant one, decided that she'd give it a try while L called a taxi service. They told her to call back in 10 minutes. Desperate to make it to the show that had started twenty minutes ago, L called the Richmond Police Department, who had no earthly clue where we were. They narrowed our location down, and the waiting game began. I offered to perform some of the highlights of the So You Think You Can Dance? season, using a street lamp and the dead squirrel as props, but I decided that the bushes outside of the car were too scary. 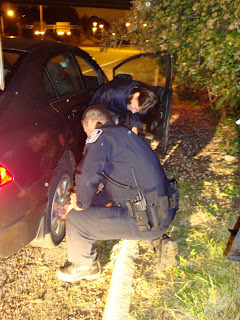 An officer finally arrived, and wasted no time telling us that he "does not change tires." L pleaded with him and he told us that we didn't look like hooligans, so he would help us. The P.D. doesn't change tires in case bad guys grab their guns and run away with their squad cars. I thought about this, as it might have given us a quicker arrival at the show, but I didn't want to tarnish my record of no felonies. 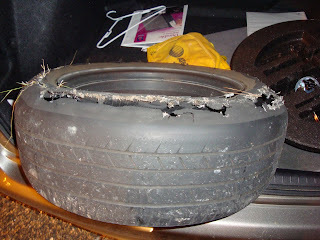 This is what the tire looked like on L's car! To be fair, it is her husband's car, and that's all I'm going to say about that. Mr. Officer finished up, and we were on our way! Our seats were so high up that I was glad we brought binoculars. So worth all the trouble to get there though. Beautiful dancers! A shot of my favorite dance of the season. Amazing to see in person. I had my eyes glued to my binoculars. Check out that great lift in the bottom right corner (Kayla and Ade). End of the show with confetti and everything. I was so pleased that I got to see all of my favorite routines from the season, except for 3, which I think they performed in the first half of the show, which we missed. Sadly, the squirrel was unable to attend the show at all. There's always next time. "There's dancing, and then there's da-a-ancing, and then there's da-a-a-a-a-ancing." HAHAHA!!! Oh my I laughed so hard at this. Seems like you had a blast! That was one bald tire! I'm glad you finally made it to the show. What a night! That tire is pretty scary looking. I know that you were disappointed to miss the first half of the show, but at least you got to see some of it. Having the tire go out on the way home wouldn't have been much better! What an adventure! You all should consider joining AAA. They change tires, they come when you call, and you get discounts on motels and things. Glad you had some fun in spite of the tire! Love that you're channeling Ellen! Oh I am so sorry that you missed the beginning! I would be FREAKING out! Of cours, I paid attention when my husband taught me to change a tire...too bad I wasn't with you. Love the pictures! I am so excited! Not too much longer for me! I'll be back later to catch up, but I HAD to get to this post!